San Pedro’s scenic and secluded Point Fermin Park is the perfect location for Shakespeare’s Hamlet. Guests are surrounded by foliage, with the occasional leaf falling onto their laps, and a fitting view of the Pacific Ocean. The trees blend into the stage’s Elsinore Castle, set in Denmark during the turn of the seventeenth century. Guests are encouraged to bring a picnic (or enjoy a pastrami sandwich and cup of hot cocoa from concessions) while bundled in a blanket, amid the salty ocean breeze. Tragedy has never been so much fun. This production of the longest and perhaps most famous of Shakespearean plays somberly opens with the deceased King Hamlet being carried in front of the stage and everyone, namely Prince Hamlet, mourning. The plot takes an unexpected turn as Hamlet’s mother then abruptly marries her late husband’s brother, Claudius, Hamlet’s uncle. This outrages Hamlet, who proclaims his mother to be jumping into “incestuous sheets.” Hamlet then encounters his dead father’s ghost, who tells Hamlet the truth – that Claudius murdered him – and demands to be avenged. Hamlet must usurp the new king; he vows to do this and begins by slipping into a state of feigned psychosis to test those around him. From general uproarious madness to the gentle and dark “To be, or not to be” soliloquy, Cylan Brown is spot on as the famous Prince of Denmark. His acting is convincing and natural in lieu of the complicated Shakespearean script. He is able to make the audience laugh (a lot more than expected) with his mannerisms and over-the-top portrayal of Hamlet’s “insanity.” On the other hand, he is able to make us feel overcome with melancholy, be pensive alongside him and linger in suspense. 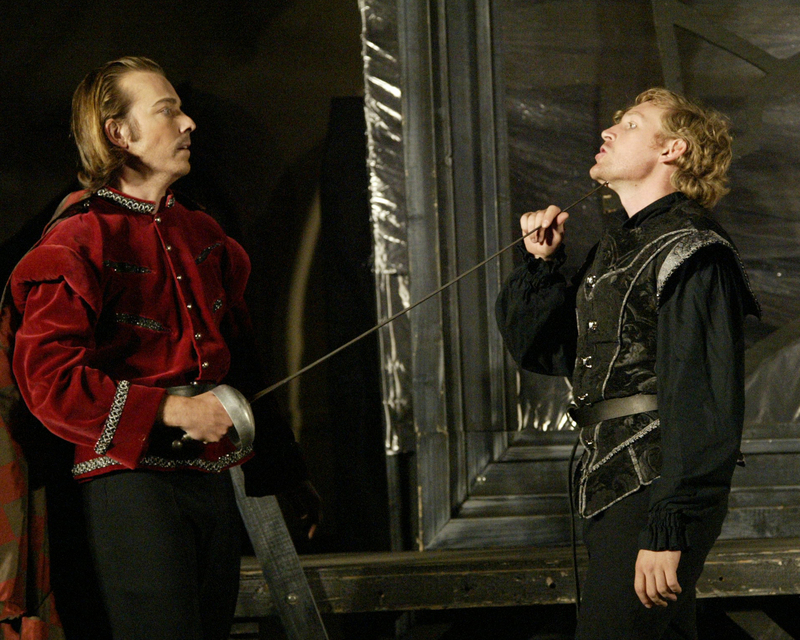 Oh, and he’s not too bad with a sword, as demonstrated by his duel with Laertes. The rest of the cast is very fitting as well. Kristina Teves and Jay Castle portray Gertrude and Claudius, respectively; the two are credible as Hamlet’s conflicted mother and conniving uncle. While Gertrude’s intentions are unclear, the scene where Hamlet confronts her in the bedroom, is nonetheless gripping. Gertrude seems surprised and truly afraid, as Hamlet reveals what he knows about Claudius. Jay Castle brings out a lustful, devious and scheming Claudius, who is deserving of Hamlet’s abhorrence. Laertes and Ophelia, played by Nick Fawwaz and Olivia Delgado, are a believable brother and sister duo. Laertes has the upper hand in the relationship, warning Ophelia to stay away from Hamlet, despite her love for him. He eventually becomes Hamlet’s worthwhile contender. When Ophelia is commanded by her father Polonius, played by Charles M. Howell, to spy on Hamlet, she has no choice but to obey. Hamlet sees through this ploy and does away with her, in a harsh and cold manner. While Ophelia is sadly cast aside and quieted by the patriarchal power structure of her time, her climactic albeit tragic ending is executed with grace. Another dynamic duo is, of course, the comedic Rosencrantz and Guildenstern, spies for the king and old “friends” of Hamlet. They are portrayed by Garret Replogle and Robert McHalffey. The two are well-versed in silliness and incompetence, and are likable despite their deceitfulness toward Hamlet. They are rightfully outwitted by Hamlet in the end but bring a good amount of comic relief to the stage. Through all of this, Hamlet has one true friend, Horatio, craftfully portrayed by B.J. Allman. The rest of the cast – Michael Ring, Chris Aron, Tyler Gray, Greg Prusiewicz and Andy Kallok – are on par with the main players with their consistent acting and subtle humor. While Hamlet is one of Shakespeare’s most famous tragedies, audience members are more often laughing than despondent. Shakespeare by the Sea does a truly outstanding job with Hamlet. I have both read and watched other versions of the play, and this production was by far the most enjoyable for me. The artistic and production staff along with the actors – especially the charismatic lead – bring their personalities into play and create nuances unique to this production. Hamlet is an excuse to get away from bustling downtown Los Angeles and escape into a more peaceful part of the city. It is refreshing to be in an area surrounded by not only the ocean but green and quiet. It’s the perfect way to spend an evening that’s both serene and entertaining. Tickets are free for all productions but Shakespeare by the Sea accepts donations. Please visit http://www.shakespearebythesea.org/wp/ for more info. Friday, June 27 at 8 p.m.
Thursday, July 3 at p.m.